Gravity Yoga is located in downtown Olympia. 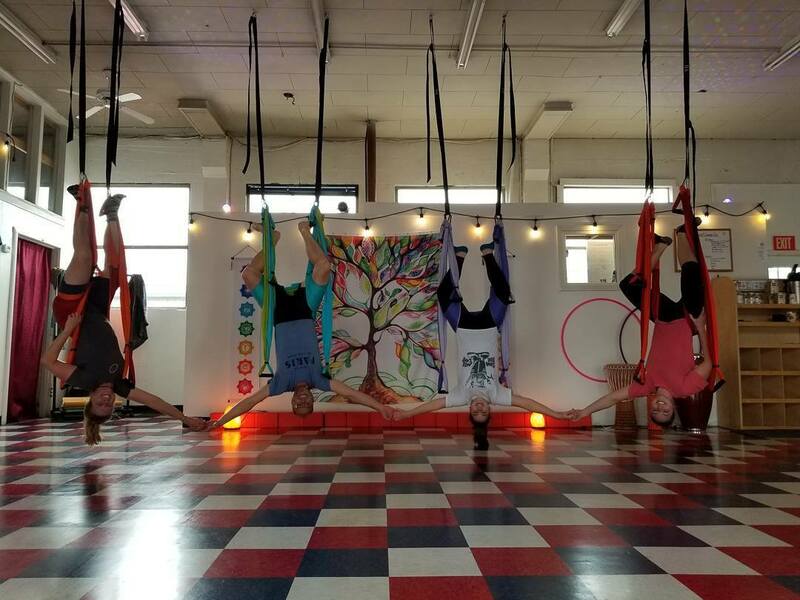 While yoga swings may look intimidating at first glance, instructor Lori Capra and her students will assure you that they are far less scary than they look. Yoga trapeze is a type of yoga practiced using cloth swings to support and stretch the body in ways that would be impossible normally. Because the swing can be used to aid your balance, you can better support yourself and achieve poses you might not be able to accomplish otherwise. This improves core strength tremendously. The use of the trapeze makes stretching more accessible and safe, as well as creating postures that access different areas of the body than floor yoga. Lori Capra shows her students how to do a backbend on the trapeze. Lori has been practicing yoga her whole life. She noticed that even with regular yoga practice, however, she had imbalances in her structure and musculature. She installed a pull up bar in her house and noticed that she was strengthening her core quite a bit. Then she learned about yoga trapeze and ordered a swing to try it herself. “I noticed amazing effects right away. The traction, support for stretching and moves for strengthening the core were accessible – as well as endless,” she said. Lori completed her 200 hour yoga teacher training in 2015 with Great Heart Yoga in Olympia. In 2016, she complemented her certification with Yoga Trapeze Teacher Training with Yogabody in Barcelona, Spain. 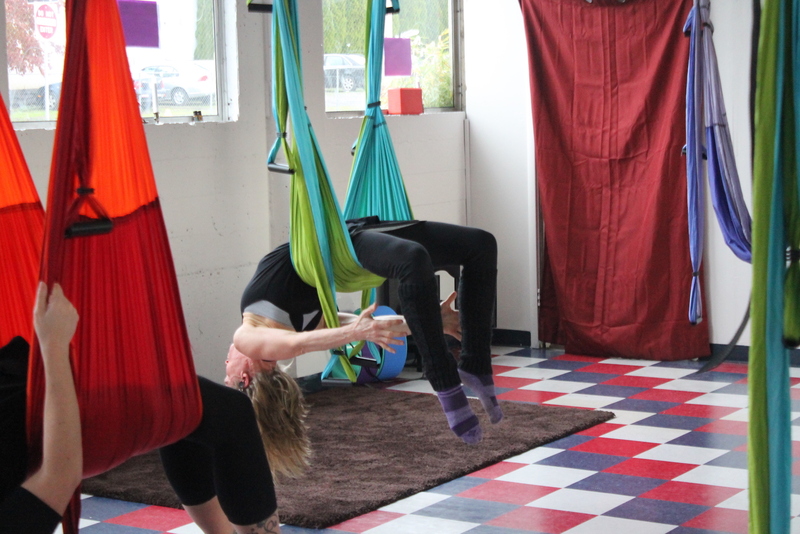 Since she’s returned from the training, she started teaching yoga trapeze, first in McCleary and now in Olympia. She previously taught at various locations in the Olympia area but recently felt ready to start her own studio. “It has been fun, but after a while, it became hard for me and my students to keep track of when I was going to be where,” said Lori. 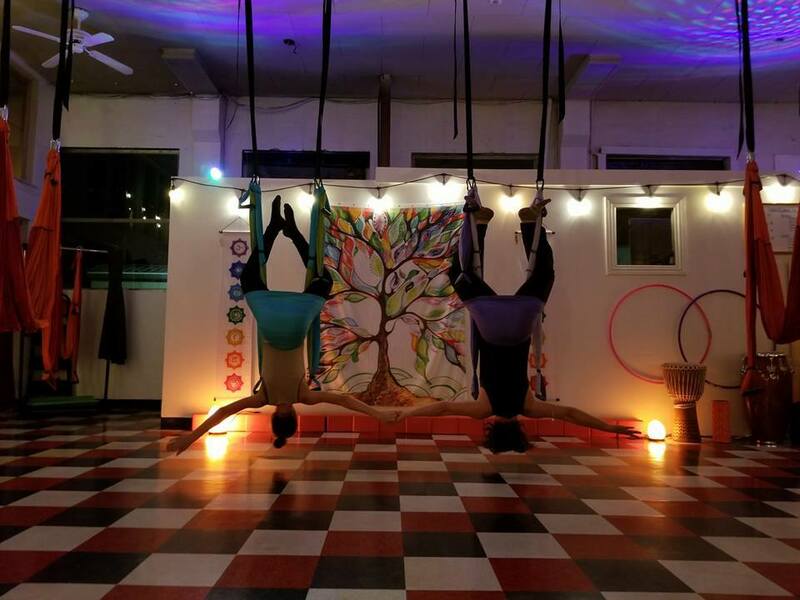 “So this summer, I started looking into finding a permanent space to centralize my efforts.” She was able to secure a location for her own studio on 5th Avenue in downtown Olympia and opened Gravity Yoga. Lori has big plans for the business. She will soon be renovating one room into a hot yoga studio. The studio includes a food nook with healthy juices, coffee and snacks including Rainbow Cloud Kombucha on tap for after workout rejuvenation. She aims to offer lunchtime classes to cater to the state workers and businesses nearby as well. Gravity Yoga offers classes that are a fit for any skill level. Beginners will learn the basics and more advanced students will have the opportunity to try out more challenging moves. Lori hopes to offer yoga wheel classes and private yoga parties as well. Yoga student Elizabeth Custis owes much of her recovery from cancer to yoga. Elizabeth Custis started practicing yoga trapeze two years ago when she was recovering from chemotherapy. “My first plank, I was shaking. I realized how weak chemo had made me.” Lori then worked with her to modify moves that she couldn’t do to strengthen and improve where she could. Elizabeth started going to classes several times a week and found that the other women in the class, as well as Lori, were overwhelmingly supportive. Now she’s looking and feeling much healthier. “I was worried it would be a bunch of super fit yogis and I wouldn’t be able to keep up,” Custis said. Instead, she was welcomed by women of all different shapes, sizes and abilities along with instruction that was tailored to her needs, pushing her when she needed it and accommodating her as she gained strength. 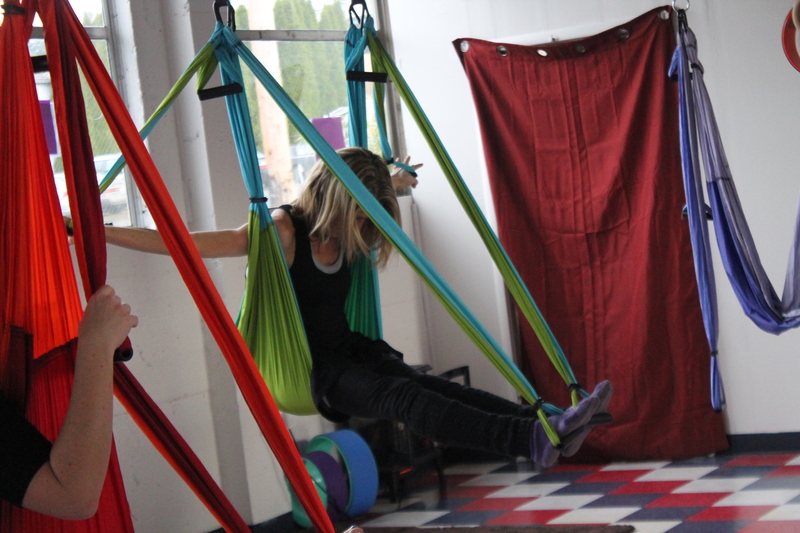 Yoga trapeze offers a unique way to stretch your whole body while being supported in a gentle way. Many students find that they feel better after just one or two sessions of yoga trapeze. “I can feel a difference in my body already, ” student Lori Waterman said. And, once they try it, they tend to become hooked. Watch Lori in action during a recent class in the video below. Gravity Yoga currently offers Trapeze Yoga classes weeknights at 5:15 p.m. and 7:00 p.m. and Saturday at 10:00 a.m. and 11:00 a.m. Gentle Floor Yoga is offered on Wednesday and Friday at 7:00 a.m. Check the Gravity Yoga Facebook page too for class time updates about new offerings. Call or text 360-451-3179 to reserve your spot. Classes are $15 your first time or purchase three classes for $30, getting your third one free.